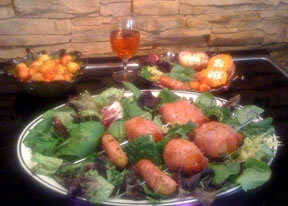 Grilled fruit stuffed with cheese, wrapped with prosciutto and served over leaf lettuce. Split each fruit in half. (Do not split Bananas.) Remove seed and some of the flesh. 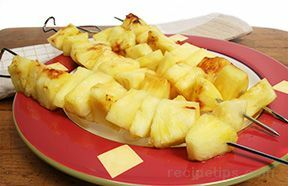 Rub with lemon to prevent browning. Stuff with Goat or Ricotta cheese. Put halves back together and wrap with Prosciutto. 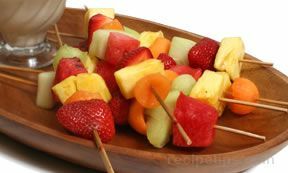 Skewer three fruits together and lightly grill, 2-3 minutes on each side over medium heat. Serve over Leaf Lettuce tossed with one part Balsamic Vinegar to two parts Extra Virgin Olive Oil. Sprinkle with chives.